One of my partners, Dory, flood irrigating a field at Red Tractor Farm. We have an underground pipe from the turn out that takes the flood water directly from the ditch to our fields. Where does our water come from? Too few of us in the United States ask this question as we turn on our faucets and partake in a seemingly limitless supply of clean drinking water. Some communities, such as Flint, Michigan, have recently had to directly address this question as they find their water sources poisoned and toxic. Here in Albuquerque, our water supply is quite precarious. Despite the beautiful Rio Grande flowing directly through our city’s heart, our situation is not one of plenty. We have been in a mega-drought, and March of 2016 was proclaimed to be the driest March on record. The last few months definitely have not shown an increase in precipitation. Here in the desert Southwest, lack of water is not the only threat we face within the Rio Grande-Albuquerque watershed. Contamination is as serious a concern as it is for the residents of Flint. Just a few years ago it was revealed that the Kirtland Airforce Base has been aware of a massive leak of jet fuel since as early as 1999. Albuquerque sits directly atop of an aquifer, leaving it particularly vulnerable to contamination. In addition to the jet fuel, developers have come through seeking to build large housing compounds on the edges of our cities. Projects such as the proposed Santolina development would stretch our already scarce water supply even thinner. We must protect our water resources for future generations, not squander them away in a bid to make the desert bloom more than it already does. Despite our tenuous situation, Burquenos and all New Mexicans have traditionally depended on each other to share and communally distribute what little water resources we do have. This is evident in an annual blessing and celebration that takes place here in the South Valley of Albuquerque honoring our precious water supply and the patron saint of farmers, San Ysidro. Every year people gather at a small park and shrine for San Ysidro and walk along one of the many Acequia ditches that run throughout the community. We come together at a place called the Sanchez Farm, and there are sacred dances, prayers, and flower petals given to the treasured waters to help ensure a vital season for all in our community. 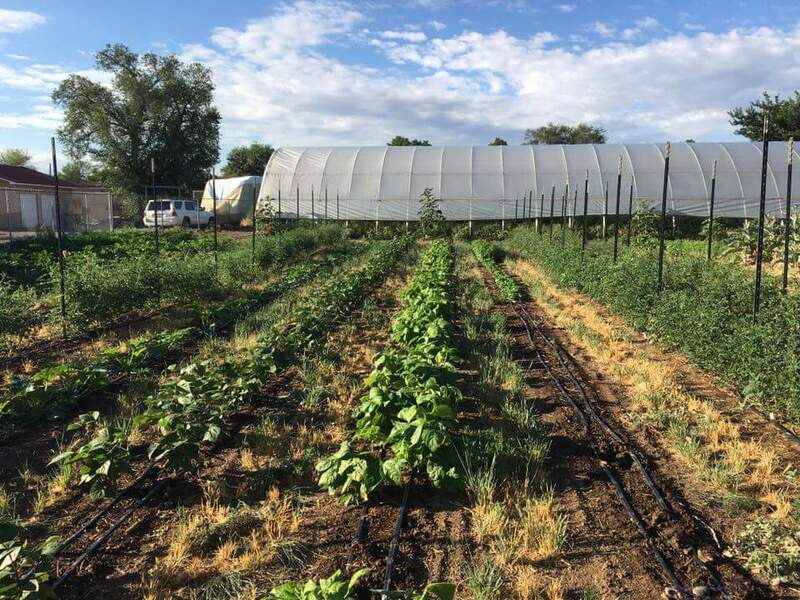 In addition to participating in this event, at Red Tractor Farm we work together with other farmers on our Acequia system to ensure that we all get water. Each year it is the responsibility of farmers to clean out the ditches together, and we elect Mayordomos who decide the schedule for the distribution of water. When you get a call from the Mayordomo—rain or shine, day or night—you go out and open the compuerta and water your fields. When there’s water there’s water, and when there isn’t, there simply isn’t. Three years ago all farmers in the Rio Grande Valley were shut off in mid-July from Acequia irrigation. Many small and large farms alike lost crops that were dependent on the floodwater. Since then, we’ve depended more on well water. Both methods involve a give and take. 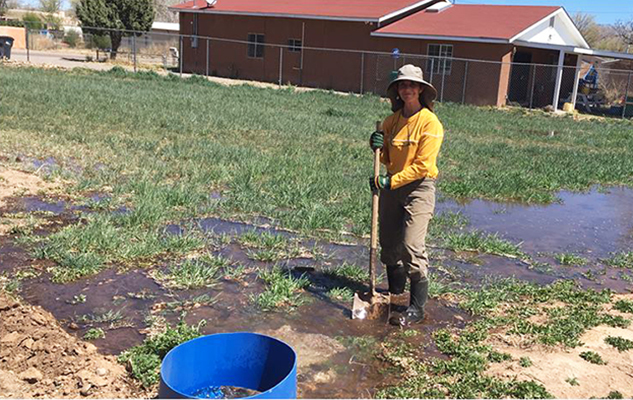 Irrigating with the Acequia means depending on water that isn’t always there while also losing 50 percent of the irrigation water to evaporation. Depending on the well, however, is a catch-22. While the well depletes our precious aquifer, it is 98 percent efficient because we deliver the water through t-tape directly to the crops’ root systems. One of our most sustainable options is to gradually reduce our crops’ demand for water through the slow but sure process of seed-saving the best of our crops each year. It is in this way that we hope to develop more drought tolerant tomatoes, peppers, corn, beans, squash, and flowers. When we do have to buy seed, we try to select Middle Eastern varieties known for their drought tolerance. Every year, seeds that we have trained to thrive in our tough environment do a little better than seeds we procure from states known for their water abundance, such as Vermont or Washington. Together, we can work towards creating an agricultural system in our region that adds to instead of detracting from our precious water resources. Agua es Vida: Water is Life.